The correspondent performs all the same functions as a lender, except they may table-fund, or have non-delegated underwriting or closing document preparation. There is still substantial operational risk in the correspondent business model, so the principals must have operating controls for all positions. Regulators call this a "written supervisory plan" because it defines the company's expectations for the employee's roles. The correspondent package allows the entity to acquire all of the procedures necessary to manage the business and comply with laws, and allows the company to upgrade to additional elements if the model changes in the future. Dependent on your business model needs, we offer money-saving packages of modules designed for you. In this way, you can get the most complete documentation you need for your business model as a savings of 40%-70% over the a-la-carte individual modules. 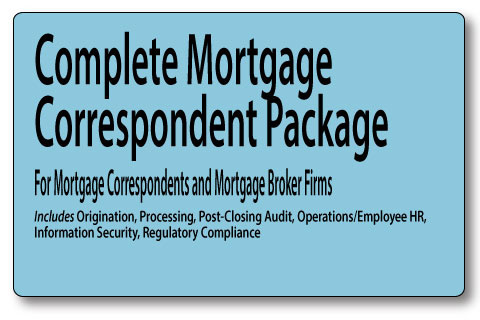 ﻿﻿This package contains everything for the Mortgage Correspondent or Broker Branch Operation; Origination, Processing, Quality Control, Operations, HR, Information Security, Compliance.